Today’s guest post is by Joe Ware, Christian Aid’s Church & Campaigns Journalist. This piece is taken from his recent interview with Father Jens. Joe tweets at @wareisjoe. A Swiss monk working with Christian Aid in Northern Iraq has spoken of people fleeing the forces of Islamic State with nothing but their pyjamas. 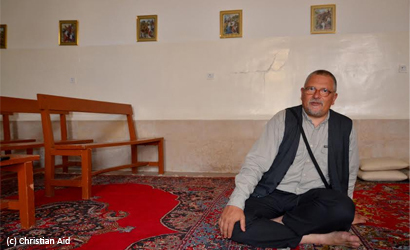 Father Jens’ Church of the Virgin Mary in the city of Sulayminiyah in Kurdistan, is now home to 160 internally displaced people who have fled for their lives. The church, which normally is the home of just 15 people has had to refurbish three neighbouring homes to shelter the extra numbers. Despite the hardships facing Christians Father Jens’ thoughts were also with those of other communities. He said: “I have to say that situation of the Yazidi and some of the Muslim refugees is much worse than for the Christians. The church has been supplied with blankets, tents and mattresses from Christian Aid partner REACH. Christian Aid’s Emergency Iraq Appeal has received donations from all over the UK and abroad. While new refugees are still entering Sulayminiyah the church is trying to plan for the future. Some Christians are keen to return to their villages to retrieve what belongings they can but it is dangerous as much of the area has been mined. For those that stay, work and more permanent support will need to be found. Father Jens said: “If they stay there will be a need of apartments and of work. Even assuming they get apartments, many don’t have anything. They will need help to get the basic equipment for the houses and so on. “The next big thing is probably the problem of education. The school year will start in October. It is very important that education is allowed to carry on. It is a big problem for young students because they have been in the middle of their exams and because of the conflict they couldn’t finish them. For more information about Christian Aid’s Emergency Iraq Appeal visit www.christian-aid.org/iraq. Guns not bibles are the only things that are going to stop these atrocities. As a country we must act now to stop the cancer of IS spreading. People of any religion (or none) must be free to live their lives. Unfortunately political correctness has fostered an environment of protectionism that has enabled UK citizens to think it’s ok to go and fight for these cowards. I think it’s time our leaders grew some and started acting tough!!! reblogged on baldvicar, thanks for this post. We’re meeting on Sunday evening to pray for peace as part of the global prayer meeting. Find and time and some people and join in yourself.